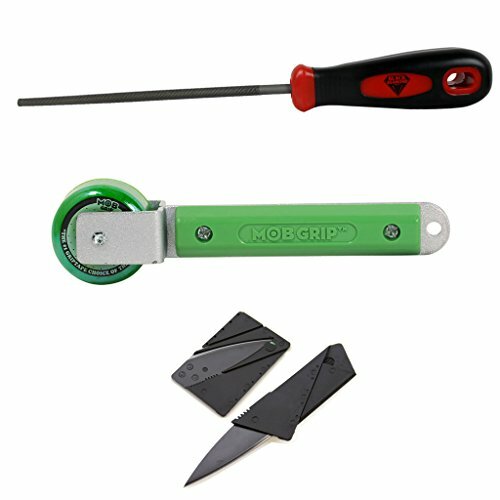 This Griptape application kit includes a MOB grip roller, BLACK DIAMOND griptape file and cutter tool. Use this roller to ensure maximum bond pressure when applying Mob Grip. The Black Diamond griptape file ensures you get the job done right the first time without those nasty jagged edges. Make cutting griptape on the go easier than ever before with this pocket sized griptape knife. Just three ingenious folding operations turn the card into an elegant pocket utility tool. Less bulky than a pocket knife and as sharp as a scalpel. Gripping your board is the hardest part of building a skateboard. Make it easier with this kit! This Griptape application kit includes a MOB grip roller, BLACK DIAMOND griptape file and cutter tool. Use this roller to ensure maximum bond pressure when applying Mob Grip. The Black Diamond griptape file ensures you get the job done right the first time without those nasty jagged edges. Make cutting griptape on the go easier than ever before with this pocket sized griptape knife. Just three ingenious folding operations turn the card into an elegant pocket utility tool. Less bulky than a pocket knife and as sharp as a scalpel. Gripping your board is the hardest part of building a skateboard. Make it easier with this kit! If you have any questions about this product by Mob, contact us by completing and submitting the form below. If you are looking for a specif part number, please include it with your message.